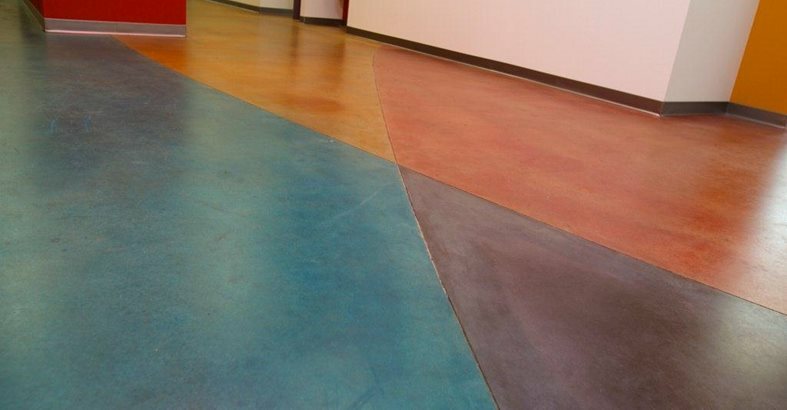 "Dyes can get the applicator into more vibrant colors such as yellow, blue, and purple to name a few," says Bob Harris, president of The Decorative Concrete Institute and author of Bob Harris Guide to Stained Concrete Interior Floors. The nice thing about working with dyes is that you can mix them at the jobsite to obtain your desired color. Dyes are often used in conjunction with acid stains to produce a variegated look and, in most cases, complement the already stained floor. Les Davis, from American Decorative Concrete (maker of ColorJuice dyes), had this important comment about concrete dyes: Translucent dyes penetrate the concrete drying in less than one minute in most climates with minimal cleaning required following the application. Therefore, the applicator completes the job about 60% faster than a typical acid stain due to reduced dry time and less cleaning. If you protect the surface with a topical sealer and/or wax you get a very vestal floor. 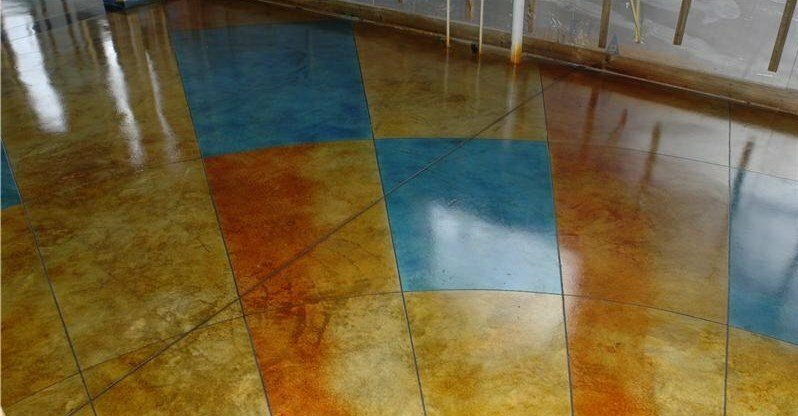 Most water-based, solvent-based, or urethane-based sealers are compatible with dyes. In conclusion, dye is a powerful solution in virtually any application when the installer is seeking rich mottling effects with minimal installation time. Compare Coloring Products Use this chart to decide between stains, dyes and other coloring methods. Dyes vs. Stains Find out what dyes are and how they differ from chemical stains. Buy Concrete Dyes Learn about buying concrete dyes, and how to use them effectively. 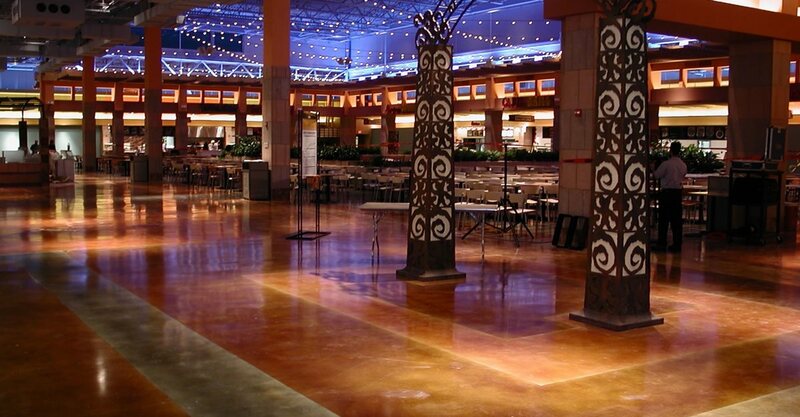 Polished Concrete Learn how concrete floors are polished to produce a high-gloss finish that never needs waxing. 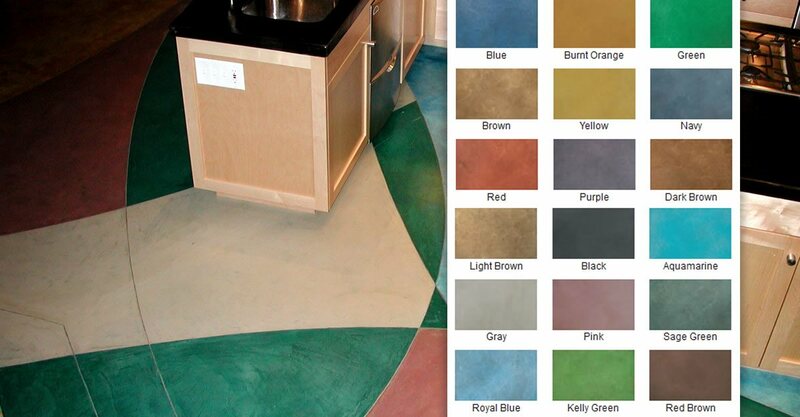 Colored Concrete Get an overview of the options for coloring concrete, and some tips for achieving stunning results. 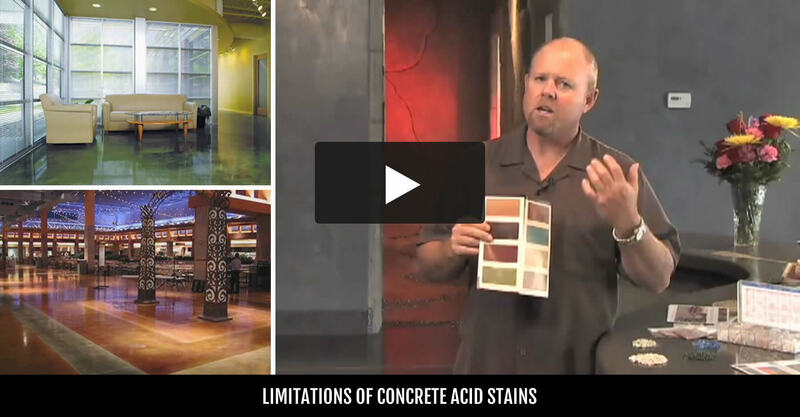 Concrete Floor Videos Watch 68 videos with expert design ideas, as well as installation & maintenance tips for interior concrete floors.